File system is the way how files and data are named, organised and placed logically in a computer, so that it is easy to find and access them.It is also used on data storage devices such as floppy disks, hard disk, optical disk or flash memory storage devices to maintain the location of the files. NTFS creates the sectors in counting of 4, Suppose File size is 18, it will create 5 sectors (4,4,4,4,2).It means that only 2 sectors will be lost. 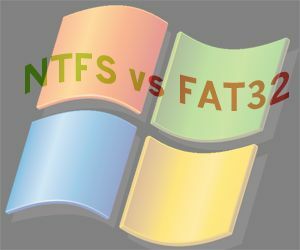 But in case of FAT32 it creates sector in counting of 16 so for file size 18, it will create two sectors (16,2) it means 14 sectors will be lost and this will effects your transfer rate.You can convert FAT32 to NTFS and vice versa.Here is the step by step tutorial to convert FAT32 to NTFS. In search bar type CMD and right click on it, Select Run As Administrator. Now Run “chkdsk G: /f “ (without quotes) here G is the drive letter. This checks the drive for errors and fixes them automatically. Run “Convert G: /FS:NTFS” (without quotes). Wait for some time, then a message will display on the command prompt stating Conversion Complete.